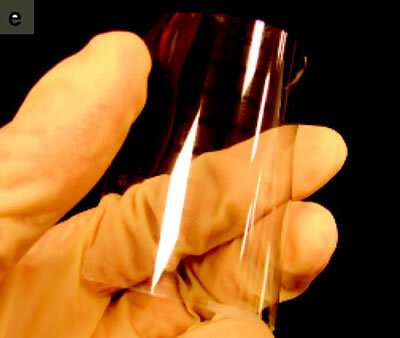 Transparent thin film transistors have been fabricated at very low temperatures by USC researchers. The new technique uses carbon nanotubes. "We fabricated transparent thin-film transistors on both rigid and flexible substrates with transfer printed aligned carbon nanotubes as the active channel and indium-tin oxide as the source, drain, and gate electrodes," Chongwu Zhou, Jack Munushian Associate Professor in USC's Department of Electrical Engineering, tells Nanowerk. "We have fabricated these transistors through low-temperature processing, which allowed device fabrication even on flexible substrates." Lower temperatures in fabrication results in faster operation and lower power consumption. The TTFT also winds up being flexible, which means you could put it in more places. And, according to the authors, it could lead to "e-paper, wearable display, smart tag, and artificial skin (E-skin)." Who would ever think of having a wearable display that was actually part of your skin? The Golden Age duo of Schachner and Zagat, that's who, in their bizarre 1931 story The Emperor of the Stars. On the translucent mica-like coverings over the orifices, appeared reddish characters... They resembled somewhat the old cuneiform writing of the Babylonians or the Egyptian hieroglyphs. Al was greatly excited, "I believe they're trying to communicate with us..."